Click on a problem or question below to see the answer. You can also use the search box above to try to find your solution. Most access issues are related to your web browser settings. Some issues can be identified by accessing the System Check. Pop up blockers must be turned off. Hold down your Ctrl key while you click the Take Course button or the Module links from the Table of Contents. If you get a blank window or a Page Cannot Be Displayed on ALL courses and from different machines within your organization, there is likely a network issue. The most common causes are that your network prohibits the loading of shockwave files or vector markup language (vml). They can see this if the firewall logging is turned on while you access the content. If you get a Page Cannot Be Displayed error on only one course regardless of the computer you try from, it is likely an issue with your record. Click the Get Help link to contact support. If you are unsure of how to proceed, guide your IT staff to this resource then click here to see a list of technical requirements. Click on Tools > Internet Options in your browser window. Click on the Security Tab and the world icon should be highlighted. Click on Custom Level and scroll down to the Miscellaneous section. In the Miscellaneous section you need to locate the setting "Allow script-initiated windows without size or position constraints." This setting should be set to Enable. Quick Fix:Once you open the course window, press the F11 key on your keyboard to full screen the window. Once you have exited, press the F11 key again to revert back to the standard view. Why does my transcript show In Progress after I’ve passed the final test and/or completed the course? Receive a satisfactory score on the final assessment. For self-paced courses, taking the final assessment without opening each module of the course, even if you pass the assessment, results in an “In Progress” Status. If this happens to you, please re-launch the course(s) and open each module – you do not have to retake the final assessment. For facilitated courses you can also run an unweighted grades to date report to see a list of all current grades. See the “How Do I” tile in your course. On your transcript, when viewing a course details page, you will see your score. Be advised however, that once you achieve a score that is higher than the minimum passing score, then your score will not update further upon subsequent exam retakes. For example, if the passing score on an exam is 70, and you take it once and achieve a 75, while the system will allow you to take the exam again, it will not update your score further if your score is higher than a 75 because the 75 is considered passing. Why don't I see Passed or Failed on my transcript? In Progress – The course is ‘In Progress.’ There are items the student or instructor must complete. Complete – The student completed the course with a passing score. It automatically goes to the ‘Completed’ tab. Need a Letter of Completion or Certificate? To view your Certificate or Letter of Completion, follow these instructions. 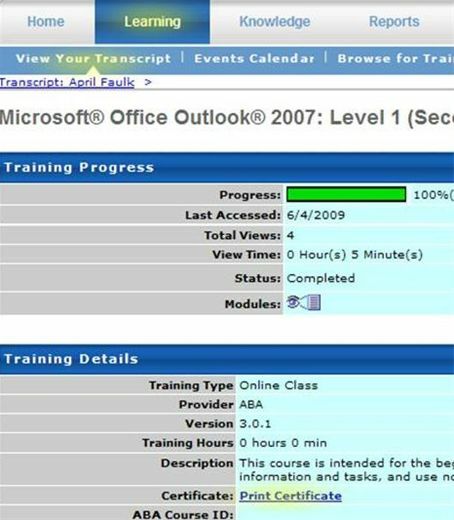 Click the title of the course to view the Training Progress details. Click the Print Button in the browser window. For self-paced elearning courses you have a total of 6 months, or the expiration of your bank’s license agreement, from the date of enrollment to complete each course. And you have unlimited access to the course materials for the entire 6 months. For facilitated online learning courses you have until the course end date to complete all work or transfer to a new session (for a $100 transfer fee). ABA’s Learning Management system keeps track of where you are and where you’ve been in a course. So, you can work for an hour on a course from work, and if you log into it later from home, start again where you left off. Note, however, that if you transfer to a new facilitated online course you will need to start again. Would you like to work towards an ABA Certificate or Diploma? Many of our self-paced courses are part of the required curriculum for ABA certificates and diplomas and earn ABA credits upon successful completion. Click here for a complete list of available certificates and diplomas and their course requirements. How long is my course? The time to complete self-paced courses will depend on your background, how quickly you read, and how much you review. However, most of the courses can be completed in 2 to 4 hours. Actual course length will vary by student and courses can be completed in one sitting or in multiple sittings. ABA’s Learning Management system keeps track of where you are in a course and will bring you back to exactly where you last exited the course. The Wealth Management and Trust are more technical in nature and may take 4 to 6 hours or longer. The Regulatory Compliance courses that were designed for specific job and a specific regulation - such as Bank Secrecy Act for Tellers - are much shorter and most can be completed in less than an hour. The job specific compliance courses that cover all relevant regulations in a single course; Regulatory Compliance for Call Center Representatives, Regulatory Compliance for Consumer Lenders, Regulatory Compliance for Customer Service Representatives, Regulatory Compliance for Personal Bankers and Regulatory Compliance for Tellers, will take longer - typically 2 to 4 hours. Facilitated courses vary from 4-16 weeks, depending on the course. On average you should expect to spend 3-5 hours each week completing class assignments. To enroll in additional self-paced, online courses, go to Learning > Browse for Training. Click here to view a list of instructor-led online courses.